Put your Pokémon-battling and puzzling skills to the test against the best Trainers in Puzzle League Village! Still waiting for Tetris Attack? Well, technically you don't have to wait any longer - Puzzle League is basically the same game with a different name. Tetris Attack, the SNES game, was a Westernized version of the Japanese game Panel de Pon, which starred its own cute cartoon characters.. 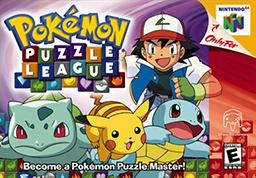 Put your Pokémon-battling and puzzling skills to the test against the best Trainers in Puzzle League Village! To succeed, you’ll need quick wits and fast fingers to clear puzzle pieces by matching like-coloured blocks. The more pieces you clear at the same time, the more points you'll score. String together huge combos or chain reactions to send powerful attacks to your opponent (either the CPU or a friend), and win badges from rival Trainers to become the Pokémon Puzzle Master! As well as battling, many other exciting challenges await you; from the 3D Puzzle Mode to the brain-busting exercises at Pokémon Puzzle University. Are you ready for a new type of Pokémon battle? Best puzzler on the VC yet. A must buy, people. ...and Mewto in the main mode. It is a great game . Pokémon Puzzle league is so great . A must download title for those who don't own a copy . Didn't expect this one but its a really nice suprise. I am starting to feel the pokemon magic all over again. I rented this game once. It was good fun. I may pick it up eventually. Wish they had picked something more exciting but what can you do. I've never played it before though so I don't know if its good. I'm not really into the whole Pokemon thing but this does look like a decent puzzle game. The constant voices would get annoying though. Not sure if I should get this. How many times is that video clip going to say "Awe poor baby"? LT. Surge says that in the Anime dub (4Krap Version) but in the original Japanese version he speaks a lot of engrish . I hate the midinoid music which is based on 4Kraps anime dubs music but other then that it's a good game . Surge's "baby" insult is straight from the Japanese original, it's not a dub invention. I agree that he's a lot funnier in the original, though. Looks good, I might get this. It looks better then the other puzzle games. The video clip above is only a small glipse of the modes this game has to offer. First: Where in the hell is this a Tetris remake? Second: It has some 3D levels. Third: Tetrisphere only comes in (great) second place of N64 puzzlers right behind PPL. Tetris Attack/Panel De Pon is a great game so Puzzle League is great by default. I assume they're putting up Puzzle League over Tetris Attack to squeeze a few more bucks out for the same game. No thanks, even with the option to turn off the damn voices. This was a great game. If you get good, a two-player match can run on forever, especially in 3-D mode (my brother and I kept one going for at least 20 minutes once). If you've ever played any version of Puzzle League, this one is worth the points, even if you don't really like Pokemon so much (due to the 3-D mode that isn't in any other version, not even on DS). I guess this release is to make up for the fact that they can't give us Tetris Attack due to title issues, huh? Title issues? Then why was Tetris DS developed and published by Nintendo? Because they were willing to fork up the fees for a full retail release, but seem unwilling to relicense the name for a budget retro download release. well who does own the rights to the Tetris name at the moment? and i'm surprised they don't just change all appearances of the word "Tetris" to "Yoshi" or whatever. they did something similar with Wave Race 64. Hmm. This game looks like it could be fun. However i am probably going to save my precous points and even more precous memory for wiiware games launching in a week. THQ owns the rights to Tetris. I was surprised to look at the Tetris DS box and find no mention of THQ at all, but whatever. Nintendo must have paid big for that one. They probably decided it was easier to put out Pokemon Puzzle League than re-obtain rights for Tetris Attack or even re-title the game. I kind of wish they'd import-title Panel de Pon, but that's mostly because of Lip's Stick in Smash Bros. PPL is a great game anyway, and if you like Tetris Attack, it's well worth the 200 point price difference. I like this game. The scary part is, I recognize all the songs in the game. They're catchy and I actually know the words...wow. I feel old now. Either way, Nintendo doesn't own the rights to the name and wouldn't want to pay for them for a VC game. Not when the easiest way to do things is to release PPL, anyway. From what i researched this game got all the features of tetris attack plus more . btw Tetrisphere itself is also a great game for which i got it for $10.00au as compared to vc's n64 titles for $15.00au=1000 points . But still i find vc's priceses a great deal . I'm thinking we will see it tomorrow. N64 releases are very close together. For those wanting to know, this VC version is exactly the same as the N64 original. Voices, music - right down to the jaggies in the anime sequences. @Raichu06. Better video output and no lame filter mean you're actually seeing the pixels now rather than them being a blur. Can someone tell me if aside from the pokemon everywhere (which i don't mind at all) how does this compare to tetris attack which i loved (just say as good as or better and i'm there). Need a good puzzle game on the wii and this will go great along side dr. mario. To Starwolf-Well idk I have an HD TV in which all my games look good and even have the component cables but this games doesn't look good... idk I guess the N64 is showing it's age now lol I am going to redownload the game and see if there is a difference. This is the one pokemon game I never got on n64 when I was younger. EDIT: I mean, the core gameplay is identical. There are more game modes (3D) and options (records, save slots) to flesh out the main puzzle play. I think the extra features are worth the extra $2 if you can stomach the pokeymans. I downloaded this game simply because I remember seeing someone playing it on a display cabinet in EB games, and thinking it looked cool. If your wondering if you should download this game and you ever enjoyed playing columns or Bejewled, go for it. You'll find a suprising amount to do here. I've been meaning to get Planet Puzzle League for DS as my Tetris Attack of choice, but I've thought about getting this version for the 3D mode alone. I'll live with the annoying voiceovers. Absolutlely the greatest Puzzle Game of all time. It's better than Tetris Attack and Kirby Avalanche. Im a little biased on it because im a big pokemon fan but it plays great and is extremely fun. Can you beat Mewtwo on SuperHard mode? I remember renting this game on N64, getting addicted and loving it... and never getting around to buy it. I was SO STUPID. So I downloaded it recently, and it's fun. I can only win the "Very Hard" battles when the AI character makes just the right self-destructive mistake. We'll never see the old Pokemon Stadiums on Virtual Console - without Game Boy connectivity, they're pointless. Unless you get a kick out of battling rental Pokemon and playing "Kids Club" minigames all day. Although I hate Pokemon, this is a great puzzler. Though I'm not interested in puzzle games (besides pac-attack) i may get this one. I'm surprised they released this before Pokemon Stadium. I'm not. Pokemon Stadium will never come to VC because of its reliance on the GB game. I suppose they could rework it slightly to include the GB game maybe. A fun, exciting, and challenging puzzler. a must for all puzzle and Pokemon fans! Nothing is more addictive than Super Hard mode against Gary on Pokemon Puzzle League. You"ll spend HOURS trying to beat him. I just can't put the game down. I remember borrowing this at the local video shop with my sister for $5 over night, definitely worth the $5! "I'm not. 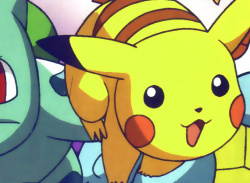 Pokemon Stadium will never come to VC because of its reliance on the GB game. I suppose they could rework it slightly to include the GB game maybe." Maybe they'll do something with stadium and heart Gold/Silver?